Just thought I’d drop in on Tidelines to share a recent phishing email I received that even had me second guessing for a minute or two. These scammers are really getting crafty in their attempts to fool us into their sneaky scams. In today’s world where everything is connected to the world wide web, it’s imperative that you stop for a minute and carefully inspect suspicious emails and website popups when they appear. I share these stories so that you may look at my thought process when trying to decide whether or not something is legitimate, or just an attempt to fool me. So, here is the email as it appeared on my phone. Now, since I own Apple products, I didn’t immediately delete it. If I’m an Android user and owned no Apple products, then it wouldn’t make sense for me to consider it real. I see this a lot, especially with banking and financial institutions. Scammers don’t have to know which accounts you have. Take a fake bank e-mail for instance. Why open an email with the subject line of BANK OF AMERICA: YOUR ACCOUNT IS SUSPENDED when you are a customer of Wells Fargo? Don’t even consider it. It’s not the opening of the email that will harm your device, it’s the clicking of links within the email or the opening of attachments that can and will cause serious problems. Apple Logo – if this were really from Apple, then I would expect to see this logo. However, don’t trust logos. Scammers can easily steal logos and put them in fake emails. Much like if someone were to knock on your door wearing a Comcast shirt and hat. Doesn’t mean they are real. PDF Attachment (Clue #2) – so I didn’t see any links in this e-mail (links redirect you to websites) but the email did have an attachment – almost trying to get me to believe it was an invoice or something. Attachments from people you know are okay. Attachments from unknown senders are NEVER okay! Inspect the Sender’s E-mail Address (Clue #3) – so, even though the sender is identified as “iTunes Store,” anyone can put any name they want, but if you press the name (on a tablet/smartphone) or hover your mouse over the name (on a computer), you will see the email address listed. 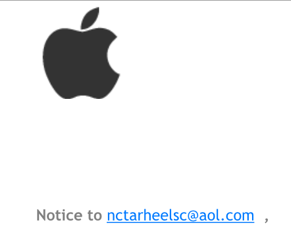 Lots of times, this email address will have nothing to do with the company they are pretending to be. In my case, the sender’s address was no_reply.email.apple.com_mailerid_HWHABGEI9LI7N.support@delivery-daemon-group.org. Way too long an email to be trusted. Incorrect Grammar (Clue #4) – After careful inspection, I stumbled on this sentence near the end of the email: IF NOT THE TRANSACTION YOU DID FOLLOW THE STEP IN THE PDF FILE. This was the clincher. Bad grammar and spelling mistakes are most likely indicative of non-English speaking persons who are trying to trick you. After gathering all the clues, I decided this email was fake, so I then trashed it. Some emails are more obvious to suspect as a fake than others, but you really have to operate under these two theories 1) Assume all suspicious emails are fake until they give you a reason to believe it’s legit, and 2) If an email gives you a funny, uneasy feeling, then consider it a fake. No reason to fall for these schemes if you don’t have to. While we are in the midst of the holiday season, the online shopping craze is in full effect. Scammers are going to use this time of the year more than other times. Be leery of emails claiming your order is canceled or held, your shipment is delayed, or your account is suspended. Just when you let your guard down, that’s when the bad guys will strike. This entry was posted in Guest Column, Tech. Bookmark the permalink. I just received this exact same email. I read your Tidelines and serendipitously had just received such an email. I opened the email but not the PDF Attachment. Thanks for the information that confirmed my actions.